The Minister of Youth, Indigenisation and Economic Empowerment, Patrick Zhuwao, was forced to eat humble pie in Masvingo last week after Zanu-PF youths, together with the college students aligned to Zimbabwe Congress of Student Unions (ZICOSU), defied him from the start of the meeting throughout to the end. The drama started when Zhuwao said political slogans were not allowed at the Zimbabwe Youth Empowerment Strategy for Investment (ZimYES4Investment) held at the Civic Centre but ZICOSU provincial chairperson Tapiwa Marongere could have none of it, saying no one had powers to stop the youths from chanting Zanu-PF slogans. "Who are you to stop us from saluting our Chancellor?" asked Marongere before he chanted Zanu-PF slogans. As if that were not enough embarrassment, in a direct attack on Zhuwao, the youths said his visit was an insult to them since it was not going to add any value to them. They went on to openly attack Zhuwao for surrounding himself with corrupt and heavily indebted youths who fail to pay back the loans they got from banks years ago. 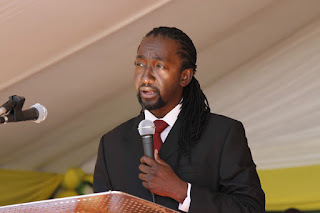 Agitated youths threatened to lock up Zhuwao in the Civic Centre hall demanding that he delivers the promises that his ministry made to the youths lest he be blocked from leaving Masvingo. ZICOSU executive member Tatenda Nyoka was aggressive in his demands, saying Minister Zhuwao was supposed to leave something tangible for Masvingo. Nyoka said Zhuwao must push the government to deliver on the promises they made during the 2013 elections if they wanted the youths to continue supporting them. "You are not going to leave this place unless you give us something tangible. The cadet programme has to be brought back to make tertiary education affordable. We also want you to push parliament to adopt a quota system so that we also get representation," said Nyoka to a round of applause from the floor. Another youth Charles Munganasa emerged a hero for being frank with Zhuwao. "Minister sir, Masvingo is the only place where you can be told the truth …We are sick and tired of ministers who come here with empty speeches, wearing designer suits and hand-stitched shoes to discuss blueprints instead of implementing them. "It is an insult for you to say the government is empowering us with education when it is our constitutional right and when that education is paid for by our parents. Our parents are empowering us and not the government," said Munganasa. Marongere stood up and frankly told the minister that no youth had benefited from the youth indigenisation programme from its onset. "The youths encounter difficulties accessing land and, as students, we are struggling to find accommodation at our tertiary institutions. I want you, Honourable Minister, to allocate land to students so that we can build our own houses," said Marongere. Zhuwao then responded, saying the government should be given credit for giving education to the youth, only to be rebuked by Munganasa, who said the credit was supposed to go to parents who paid tuition fees, not government. "Credit must go to our parents who paid fees. Education is our right… we cannot speak of empowerment when the people of Masvingo are treated as second class citizens in their own country…the economy is centralised in Harare," said Munganasa. Onward Chironda, another youth activist, accused Zhuwao of appointing into his steering committee people who had a traceable record of misappropriating funds and failing to repay loans from the Youth Development Fund. "As I was travelling around the country, I met a number of worried youths (names supplied) who were asking why you (Zhuwao) are appointing corrupt people who misappropriated previous loans into your committee," said Chironda. Zhuwao however, managed to extricate himself out of the corner by promising to address all the issues raised by the students with immediate effect. "I am going to take your request for residential stands to Saviour Kasukuwere who is the Minister of Local Government. I encourage you to register your concerns with government officials like Josaya Hungwe and Shuvai Mahofa, whom you have here in Masvingo," he said. Zhuwao encouraged the youth to come up with innovative ideas saying government had set aside US$50 million as funding for youth projects. Later, Marongere told TellZim News that the lecture was not beneficial to the province as the minister, like all other government officials who visited before, gave empty promises and nothing tangible. "The youth did not get what they expected. We thought the minister was going to bring something tangible but he only left us with empty promises.